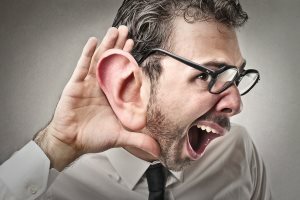 Can Your Employees Hear You? Staff retention is at the top of the agenda for 2014 as many surveys, including this one from the Hay Group, are forecasting a sharp up turn in employee turnover as confidence returns to the job market. This is why employers should be placing more emphasis on the employee retention side of the talent management equation to ensure they have a net positive human capital position at the end of this difficult period. I have been recommending various retention strategies based around engaging staff and re-engaging, reinvigorating and rehiring fallen stars in your business as a means of retaining staff. As you would imagine, these are all relatively complex and sophisticated retention mechanisms and solutions, which is why I was surprised to find that perhaps one of the most power solutions to employee retention is remarkably easy. And my attention was drawn to this solution by the recent LinkedIn Exit survey, which showed a massive disconnect between employers and staff in terms of awareness of their employee mobility program. For example, while 69 percent of HR and recruiters said that their internal career development program was well known to employees; yet, just 25 percent of employees from the LinkedIn exit survey said they were aware of their employer’s internal mobility program. It seems that your employees can’t hear you. Now, while we can’t guarantee that if the exiting employees had known about the career development opportunities within their business they would have stayed outright, we can be sure that it would have at least made a material difference to their sense of career opportunities and could have ended up in a promotion. In short, increasing employee’s awareness of your current internal mobility program is perhaps one of the most cost effective and simple ways to increase engagement levels and reduce staff turnover levels in your business in 2014. However, this may not be quite as simple as it seems to implement as we can currently see a huge disconnect between the employer’s perceptions of employees’ awareness of mobility program and the employees’ actual awareness of mobility programs. So, employers and employees need to get on the same page on this topic by really getting to grips with employee awareness levels. It could be that certain departments, demographics, locations, offices, etc., are more aware of opportunities and that there could be some blind spots elsewhere. The point is that the Linked-In research shows that what you have been doing now to communicate career development opportunities to staff is probably not been working. Your employees cannot hear you. So, really dig down into the detail to find out what the information highway blocks are. Perhaps you need to have a more multichannel communication strategy, including posters in high traffic areas, email and mobile notification of opportunities and/or a management cascade with announcements of new job opportunities at monthly team meetings. Try to use a mix of face to face, mobile and email messaging to ensure you get maximum penetration and reach for your career mobility program. This approach should enable you to boost your internal job/career marketing messaging, increase employee awareness of opportunities and hopefully reducing employee turnover resulting from lack of career development.